Of all of the guard shack companies online, we think you’ll find the most quality product comes from us at Panel Built. You might be wondering… in the world of pre-fabricated guard booths, what constitutes at quality product? A great question, and one that we’re happy to address for you. If you’re inputting a modular guard shack, you’ll likely be mostly concerned about security, durability, aesthetic appeal and interior accommodation. Thankfully, our guard booths take each one of these elements into consideration for you to ensure that when you purchase a guard booth for your property, you’re making a great investment. Though our guard houses may be used with “lighter” purposes – like at the entrance of a neighborhood, our guard houses are frequently used for legitimate safety purposes – like on military bases and construction sites. We know that security is a top priority for you when you purchase a guard house from Panel Built, no matter what you’re using it for. If your property needs a guard house, than it should be adequately protected with one. 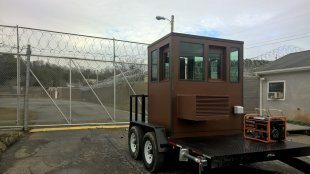 Our guard houses are up to code and guaranteed to meet all military, OSHA and construction specifications. What else matters in terms of protection? We know you want your guard house to last a while, despite the weather and despite situations outside of your control. Our guard houses are essentially weather proof, withstanding even the most extreme of conditions. Additionally, they’re eco-friendly and insulated with excellent options for heating and cooling, so you can rest assured that your security guard will be warm in the dead of winter, and sufficiently cooled in the heat of summer. Simply stated, the durability of these products are second to none because safety, security and durability is of the utmost importance. What sets our guard houses apart from the rest, and what makes them impervious to all the elements? Simple: our guard houses are made of metal – specifically, steel. In making our guard houses out of steel, we accomplish a number of things. First, steel keeps the cost down for you initially, as well as in the long run. It is extremely durable and easy to maintain, so regular maintenance will be minimal. Steel structures are extremely strong, and erosion is not likely, even over years of use. Other problems that often accompany brick and mortar or other materials? Termites, pests, cracks, and fires. Each of these annoyances exist minimally when you choose a pre-fabricated guard house. You might be wondering how a safe, all weather shack might accommodate a person (or a few people), keep them comfortable, and maintain great curb appeal? Panel Built makes it all possible, because we know that comfort and aesthetic appeal are important parts of your purchase. Interior comfort has been addressed already in notating the insulation, heating and cooling options within the metal guard houses – important items which will keep the guard house inhabitants happy. Customization options abound in terms of size, design, color and appearance, which means that aesthetically you can’t go wrong. Finishings may be added that will match or enhance the structure in order to complete the existing space or environment where the guard house will be placed. In short – we know that you want your guard house to fit in, to look natural, and to be pleasing to the eye as one seamless unit. When it comes to selecting a guard house to meet your needs in any circumstance, the experts at Panel Built have just the one for you. If you’re considering a guard booth, the last thing you want to do is make a half-hearted selection that leaves you feeling frustrated with its incompatibility in regards to its primary use. There’s no harm in asking questions – questions will lead you in making the best possible decision, and that’s why we are there to answer each and every question you have. Founded in 1995, we are a world class manufacturer of modular offices, pre-fabricated buildings and steel mezzanines. We believe in 100 percent customer satisfaction, listening to customer needs, and providing creative solutions within each budget. 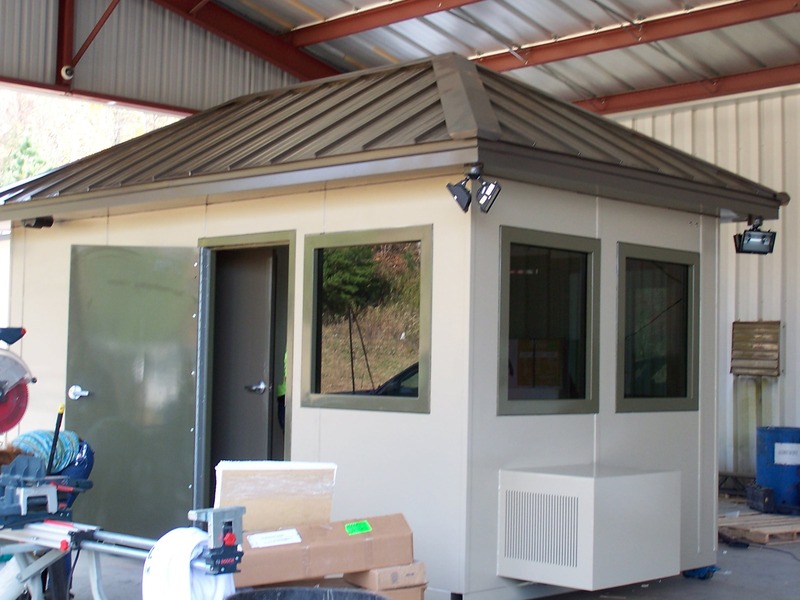 In fact, we can build a customized guard house just to meet your specialized needs. Bottom line? When you choose one of our Panel Built guard houses, you can rest assured that it will be top quality relative to the entire industry – impervious to all the elements. You simply cannot go wrong with Panel Built Incorporated.